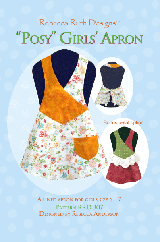 This lined apron fits girls size 5-7. Includes a fanciful petal motif option. Comes with full-size pattern pieces and instructions with illustrations. Companion to "Phoebe". RRD 307.